Philip Hammond said that the Conservatives were still clearing the mess that they inherited from Labour during the budget speech last week. That annoyed me. In 2016 I showed that the Tories have been the biggest borrowers since 1946. I thought it worth updating the data: it now covers the years 1946 to 2022. I do as a result include the latest budget borrowing forecasts until 2022, which is the expected time span of the current government. Since I know of no-one who doubts borrowing will continue until then I think this entirely fair. The data does now, therefore, cover 76 years. Labour was in office for 28 of these years and the Conservatives are expected to be for 48. The Conservatives borrowed more, not just absolutely (which is unsurprising as they had more years in office), but on average each year during this period. 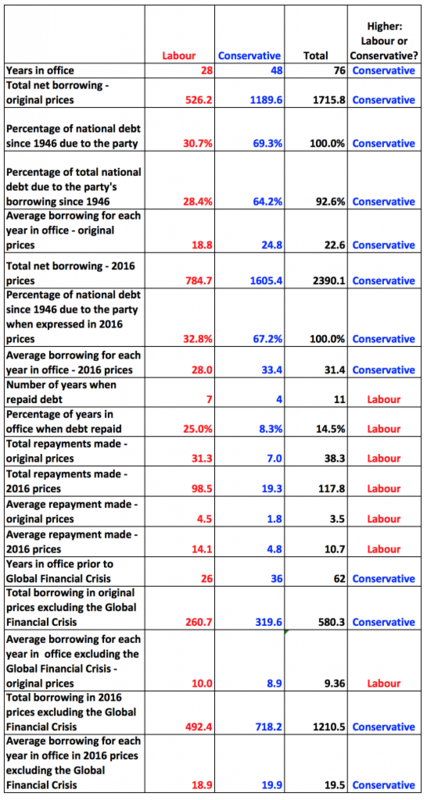 The Conservatives still borrowed more in absolute terms by a considerable margin, still created more than two thirds of the national debt and still borrowed more per year, on average, even when inflation was taken out of account. So. it’s true that Labour borrowed more than the Conservatives before 2008, but that on average the difference is very small indeed: Labour borrowed just 12% more per year, on average. Now the situation has reversed: the Tories were, in fact, the biggest borrowers for each year in office, after all. Labour do walk the talk: they repay national debt much more often in absolute and percentage terms than the Conservatives do. In fact, one in four Labour years saw debt repaid. That was true in less than one in ten Conservative years. Labour not only repaid more often, it turns out it also repaid much more in total and on average during each year when repayment was made. So what do we learn? Two essential things, I suggest. 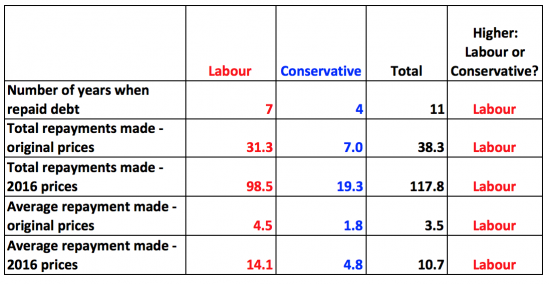 First, Labour invariably, in real terms, borrows less than the Conservatives. The data shows that. And second, Labour has always repaid debt more often than the Conservatives, and has always repaid more debt, on average. Or, to put it another way, the Conservatives are the party of high UK borrowing and low debt repayment contrary to all popular belief. The basic data on borrowing came from the House of Commons Library. GDP deflator data from 1955 came from the 2017 budget GDP deflators. Estimates post 2016 come from budget data. The data for the period prior to 1955 came from the Bank of England. Data was checked to the Treasury Pocket Data Book: as is usual there are minor differences, but too small to worry about. Budget data is from HM Treasury and the Office for Budget Responsibility. Governments in office for a year were determined in election years by the number of days each had in office: the party with the greater number being attributed the whole year. I have previously checked that lagging data by two years to allow for the influence of previous incumbents during the first two years in office does not alter the view given: it does not. The results here are slightly different to that reported two years ago in respect of earlier years. That is not because I got the data wrong then: the source data is subject to periodic checking and recalculation and this has happened in the last two years. Next articleCould You Be Dorset’s Next Successful Mumpreneur?